Our exhibit will be showcasing our entire portfolio of our Digital to Physical Product Lifecycle management solutions. What does that mean? 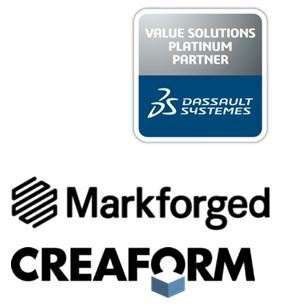 This includes the 3DEXPERIENCE platform by Dassault Systèmes, along with our 3D scanning solutions by Creaform and our 3D printing solutions by Markforged. We also have unique solutions for aerospace suppliers who want to certify to be a Boeing supplier. Talk to us about how we can help you with meeting Boeing DPD D6 quality requirements. Bring a part to scan with our Creaform Handyscan and enter our contest to win an Aftershokz Titanium headset! Adaptive Corporation works closely with Aerospace Industry manufacturers to help streamline business processes, implement model-based design practices, reduce costs and improve efficiencies around the product lifecycle. We offer a comprehensive suite of products that address the product lifecycle including 3DEPXERIENCE PLM software, metrology and 3D printing solutions. We will feature live demos of Creaform’s 3D scanners that are portable, accurate and quickly capture “as-measured” information and automatically populate the AS9102. Our 3D printer line from the award winning Markforged includes “Carbon Fiber Composite” and metal printers that address a wide range of additive manufacturing applications. For Boeing aerospace suppliers, we can help you become compliant with the Boeing D6 DPD (D6-51991) quality standard. We expedite the process of creating the FAI/AS9102 digital data to drive the inspection/quality reporting process.